Arm yourselves with the same mind. The Christian view of suffering and pleasure. 1 Peter 4:1-2 Forasmuch then as Christ hath suffered for us in the flesh, arm yourselves likewise with the same mind: for he that hath suffered in the flesh hath ceased from sin; 2 That he no longer should live the rest of his time in the flesh to the lusts of men, but to the will of God. Our life must be an emulation of Christ. 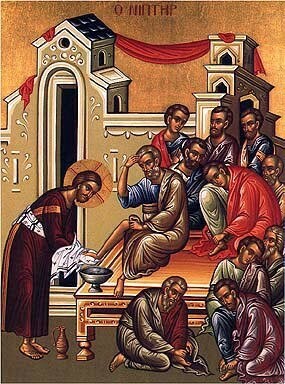 He voluntarily suffered; we must VOLUNTARILY suffer. This idea is not well known or well-liked among many people, including Christians. In emulating Christ, we acquire His mind – we think like Him, act like Him, and begin to understand Him. Since salvation is to know God (“and this is eternal life, that they may know Thee the true God, and Jesus Christ, Whom Thou hast sent”), it is essential that we acquire the mind of Christ. There is NO other way to do this except to emulate Christ, with God helping us. To experience pleasure is not sinful in and of itself, but to seek pleasure above God darkens the mind. If we are pleasure seeking creatures, we cannot cease from sin. We must have the mentality of a soldier, who is willing to forgo pleasure to fulfill his mission. It is not the “suffering” that causes us to “cease from sin”, but the willingness to suffer in order to follow God only. There is much suffering in the world that does not purify us, because we do not experience it seeking God. If we suffer in any way because of our attempt to follow God and Him only, this suffering will purify us (over time, not all at once), “like gold in the furnace”. The Fathers talk a lot about “attachment” and how important it is to free ourselves from this passion. The more free we are from attachment (which is always associated in some way with pleasure, and our own desires) the less we sin, because our motivations will change to spiritual ones. Christians are not “anti-pleasure”, but against the seeking of pleasure above God. If we are honest with ourselves, we all do this, and this is why we still sin. As we think so we are. Let us desire above all things to acquire the mind of Christ, and we will become like Christ. 1 Peter 4:1-11 1 Forasmuch then as Christ hath suffered for us in the flesh, arm yourselves likewise with the same mind: for he that hath suffered in the flesh hath ceased from sin; 2 That he no longer should live the rest of his time in the flesh to the lusts of men, but to the will of God. 3 For the time past of our life may suffice us to have wrought the will of the Gentiles, when we walked in lasciviousness, lusts, excess of wine, revellings, banquetings, and abominable idolatries: 4 Wherein they think it strange that ye run not with them to the same excess of riot, speaking evil of you: 5 Who shall give account to him that is ready to judge the quick and the dead. 6 For for this cause was the gospel preached also to them that are dead, that they might be judged according to men in the flesh, but live according to God in the spirit. 7 But the end of all things is at hand: be ye therefore sober, and watch unto prayer. 8 And above all things have fervent charity among yourselves: for charity shall cover the multitude of sins. 9 Use hospitality one to another without grudging. 10 As every man hath received the gift, even so minister the same one to another, as good stewards of the manifold grace of God. 11 If any man speak, let him speak as the oracles of God; if any man minister, let him do it as of the ability which God giveth: that God in all things may be glorified through Jesus Christ, to whom be praise and dominion for ever and ever. Amen. The readings for today, Tuesday, the 38th week after Pentecost are from 1 Peter and Mark. We should read the Scriptures with understanding. Here are a few points about these readings. 1 Peter 3:10For he that will love life, and see good days, let him refrain his tongue from evil, and his lips that they speak no guile: 11 Let him eschew evil, and do good; let him seek peace, and ensue it. 12 For the eyes of the Lord are over the righteous, and his ears are open unto their prayers: but the face of the Lord is against them that do evil. This is a quote from Psalm_34:12-16. It cannot be overemphasized how important it is to “keep our tongue from evil”. I have said before, “If you cannot stop sinning, at least be kind!” This is because the first and greatest commandment is fulfilled in the doing of the second – to love our neighbor as ourselves. Perhaps I should say: “at least be kind and hold your tongue!” because it is rare that we talk about others and do not do harm to them in some way. Some of the best things I have ever said are the things I have not said, and I am certain this applies to everyone. We may have poor self-control over many things, but God will help us in all of them if we control our tongue. Even if our thoughts are evil, if we do not let words pass our lips that reflects the evil in our heart, the fire of the passions that causes our evil thoughts will be snuffed out, just as a fire goes out when the flue is closed. 1 Peter 3:17For it is better, if the will of God be so, that ye suffer for well doing, than for evil doing. This is something to remember when we feel persecuted. The Apostle explains later that we must endure persecution gladly because our Lord was persecuted. Our life is an emulation of Him. Perhaps we cannot pray with great attention, and are a little lazy, and many other things. But if we endure persecution and even simple unpleasantness without complaining and responding in kind, God will help us in all things. There are many things we cannot do, but we can be kind to others, and we can stop complaining about our lives. If we do these things, we will truly attract God’s grace to us. It is important to note that the Apostle says that Christ suffered ONCE for our sins. We do not believe that the Eucharist is a reenactment of our Lord’s sacrifice, but rather an entering into the one sacrifice He made. The Apostle also mentions the dogma that Christ descended into Hades (“prison”) and preached to all the spirits there. This idea is repeated many times in our services. Here the purpose if baptism is described. – a “good conscience toward God”. Baptism enables us to pursue perfection and attain it. We cannot have a good conscience toward God unless we change. This is a well known idea in our daily life. We may do something terrible to someone and be forgiven by them, but we still bear a burden of unease until we have made amends or changed in some way. Our friend forgives us, and his forgiveness is not predicated upon our actions, just as God forgives us, but we must change in order have a good conscience towards our friend (or God). Without baptism, this change is not possible. Mark 12:26And as touching the dead, that they rise: have ye not read in the book of Moses, how in the bush God spake unto him, saying, I am the God of Abraham, and the God of Isaac, and the God of Jacob? 27 He is not the God of the dead, but the God of the living: ye therefore do greatly err. We show that we BELIEVE the Lord’s words when we ask those who have dies (in the body) to pray for us. 1 Peter 3:10-22 10 For he that will love life, and see good days, let him refrain his tongue from evil, and his lips that they speak no guile: 11 Let him eschew evil, and do good; let him seek peace, and ensue it. 12 For the eyes of the Lord are over the righteous, and his ears are open unto their prayers: but the face of the Lord is against them that do evil. 13 And who is he that will harm you, if ye be followers of that which is good? 14 But and if ye suffer for righteousness' sake, happy are ye: and be not afraid of their terror, neither be troubled; 15 But sanctify the Lord God in your hearts: and be ready always to give an answer to every man that asketh you a reason of the hope that is in you with meekness and fear: 16 Having a good conscience; that, whereas they speak evil of you, as of evildoers, they may be ashamed that falsely accuse your good conversation in Christ. 17 For it is better, if the will of God be so, that ye suffer for well doing, than for evil doing. 18 For Christ also hath once suffered for sins, the just for the unjust, that he might bring us to God, being put to death in the flesh, but quickened by the Spirit: 19 By which also he went and preached unto the spirits in prison; 20 Which sometime were disobedient, when once the longsuffering of God waited in the days of Noah, while the ark was a preparing, wherein few, that is, eight souls were saved by water. 21 The like figure whereunto even baptism doth also now save us (not the putting away of the filth of the flesh, but the answer of a good conscience toward God,) by the resurrection of Jesus Christ: 22 Who is gone into heaven, and is on the right hand of God; angels and authorities and powers being made subject unto him. Mark 12:18-27 18 Then come unto him the Sadducees, which say there is no resurrection; and they asked him, saying, 19 Master, Moses wrote unto us, If a man's brother die, and leave his wife behind him, and leave no children, that his brother should take his wife, and raise up seed unto his brother. 20 Now there were seven brethren: and the first took a wife, and dying left no seed. 21 And the second took her, and died, neither left he any seed: and the third likewise. 22 And the seven had her, and left no seed: last of all the woman died also. 23 In the resurrection therefore, when they shall rise, whose wife shall she be of them? for the seven had her to wife. 24 And Jesus answering said unto them, Do ye not therefore err, because ye know not the scriptures, neither the power of God? 25 For when they shall rise from the dead, they neither marry, nor are given in marriage; but are as the angels which are in heaven. 26 And as touching the dead, that they rise: have ye not read in the book of Moses, how in the bush God spake unto him, saying, I am the God of Abraham, and the God of Isaac, and the God of Jacob? 27 He is not the God of the dead, but the God of the living: ye therefore do greatly err. The Wisdom of Jesus, the Son of Sirach is one of the “Wisdom” books of the bible, and is one of the so called books of the apocrypha. This is a startling book, for many reasons. It contains many prophesies, and much very practical and earthy advice. In some ways it is like “Proverbs” or the “Wisdom of Solomon”. Concepts in it are used by the Lord Jesus Christ (recorded in the Gospels) and other NT authors. Sirach makes rather startling prophesies. This is a reference to eternality of the Son of God, and echoed in the Symbol of faith : “Jesus Christ … begotten of the Father before all ages”. (2) Who hath numbered the sand of the sea, and the drops of rain, and the days of the world? Who hath measured the height of heaven, and the breadth of the earth, and the depth of the abyss? (3) Who hath searched out the wisdom of God that goeth before all things? This is very reminiscent of the rebukes of God towards Job. This kind of language is also in the Psalms. The church knows the answer to the question in vs 3. It is not a rhetorical question! (4) Wisdom hath been created before all things, and the understanding of prudence from everlasting. This is another statement regarding the eternality of Wisdom, the Son of God. If Jesus the Son of God is co-eternal with God the Father and the Spirit, then it must be that He is fully God and equal to the Father and the Spirit, because only God is eternal, that is, uncreated and ever lasting. 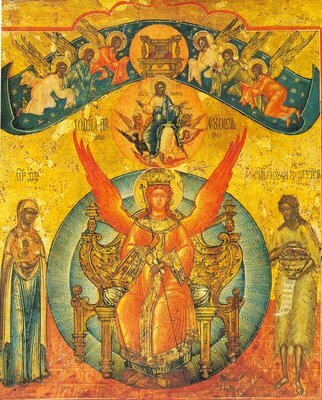 “Created before all things” is expressed in the Creed (Symbol of Faith) as “only begotten, begotten of the Father before all ages, begotten, not made, of one essence with the Father”. Of course, this cannot be temporal creation, when something changes into something else, because God does not change. This is, of course a difficult concept to understand; it can only be understood by becoming like Wisdom, that is, to emulate Christ, and become perfected. See below. (5) The word of God on high is the fountain of wisdom, and her ways are everlasting commandments. (6) To whom hath the root of wisdom been revealed, and who hath known her wise counsels? (7) To whom hath the discipline of wisdom been revealed and made manifest? and who hath understood the multiplicity of her steps? This is not merely poetic and rhetorical language. This question is answered by Sirach immediately (vs 8-9). Another answer to the question: “To whom…”, given throughout Sirach and on every page of the Scripture in many ways is “Blessed are the poor in spirit for they shall see God”. (Matthew 5:8). God reveals Himself to those who care able to know Him. Only the pure can know God. It seems like a fantastic thing that man, who is limited, may know God, the limitless, but the promise is clear, as well as the path to obtaining the promise. (8) There is one most high Creator Almighty, and a powerful king, and greatly to be feared, who sitteth upon his throne, and is the God of dominion. (9) He created her in the Holy Ghost, and saw her, and numbered her, and measured her. (10) And he poured her out upon all his works, and upon all flesh according to his gift, and hath given her to them that love him. This refers to the incarnation of the Son of God, and the participation of the Son of God in the creation of the world. “And he poured her out upon all his works” – “her” is the pre-incarnate, eternal Jesus Christ, Who, with the Father and the Son, was the creator of the universe and all that is in it. “… and upon all flesh according to his gift, and hath given her to them that love him.” – This is a prophesy of the incarnation. Remember that the Scripture is always about you. It is useless to read the Scripture without actively seeking to be instructed. Sirach tells us that the gift of Wisdom (Jesus Christ) is given “to them that love Him”. One must have evidence of this love in the way they live, think, act – in everything. The true Christian mind does not pass over these words lightly. There is a startling moral conclusion that we must have when we read about “Wisdom” in any context in the scriptures. It is always about Christ. If we do not become like Him, we will never have wisdom. Wisdom as an attribute is necessary to answer any difficult question correctly. The answer to every question is – Wisdom, Jesus Christ. The Orthodox Study Bible, Second Edition. The “You Who” language is quite burdensome, and some (not most) of the comments are a little off and remind me of my Evangelical Protestant days, and sometimes appear to not be fully rooted in the ascetical and monastic tradition of the church, but in general, this is a good resource, if used with discretion. Just remember, the Gospel is the Gospel, but not all the footnotes! Sirach 1:1-10 (also known as "The Wisdom of Jesus, the son of Sirach", and Ecclesiasticus = “a church reading book"”). The Symbol of Faith – the Nicene Creed. The Pedagogical services – Matins and Vespers. On being called a Samaritan. On the day after we have read about Holy Equal to the Apostles, Photini, the Samaritan woman, the Gospel selection has the Jews calling the Lord a Samaritan, and demon-possessed. They did not know what they were talking about! The proud, the jealous (a child of pride), the religious (or irreligious) elite – they never know what they are talking about. The Lord took their characterization and turned it on its head, in the parable about the Good Samaritan, where He is the Samaritan! A few thoughts about this reading and the place it holds in the church calendar. Recently, a priest suggested that our lectionary (the guide for when various selections from the bible are read) may need to be changed because our people are no longer biblically literate. As for the latter, he is absolutely correct – most people, no matter how much they consider themselves to be “Christian” barely know the Bible and its best commentary (from which they will learn much of its deep meanings) – the services. Matins is particularly important, and it is a forgotten service in most Orthodox parishes, even in many of those those which “serve” it and shorten it to the point that its pedagogical, theological magnificence is lost. This priest mentioned that such an important selection as first Corinthians 13 (please do not take this as being negative – if you do not immediately recognize this selection as the one about love, you have an indication that you most likely do not read the Bible enough) is read during the week, when most people are not in church services. In his estimation, he wants to at least consider a revision of the lectionary to include such readings on the weekend. The sad fact is that most people are not in church services on the weekend either, and most that do go attend only the Divine liturgy, or perhaps the last half of liturgy, often coming after the Gospel has been read and preached. Most people do not read, and many count their prayers before a meal as “praying” for the day. As a pastor, I feel one of my greatest and most important tasks is to encourage my flock to read the scriptures and worship in the pedagogical services (especially matins and vespers) with consistency, expectation, zeal and understanding. The understanding comes AFTER many years of effort; until then, much of the services, which explain the scriptures, are unintelligible to us. The Holy Spirit enlightens every man, as he is open to enlightenment, but He works with our current understanding and brings it higher. Our theological understanding as a people is very low, and our desire for theological understanding, as a people, is low This is why we are so mediocre. The juxtaposition of today’s reading with yesterday’s is startling and edifying to the student of the scriptures. By student I mean the one who reads the scriptures as the church does, with her understanding. This involves not only following the lectionary (which is a minor point – it does not really matter if your daily discipline is to read the daily readings, or if you read the scripture in some other way, but you MUST read if you want to be saved), but is especially having the same “mind” as the church regarding the scriptures. Each word is a revelation of truth, and truth is Jesus Christ. Again, in the redundancy and repetition department, this “mind” is most present in the services, and best understood when standing in prayer – reading Patristic commentaries can supplement this admirably, but not replace it. It MATTERS that this reading follows Sunday’s reading. It is been like this for a long time. Of course, the lectionary could be changed – the church has this authority, but an attempt to make sure all the “most important” readings are on Sunday is well-intentioned, but impossible. They are all important. If a person is not steeped in the scriptures, many “important” readings are as edifying to them as the reading of the phone book. We must try to awaken zeal in our flock to read, and to pray in an Orthodox way. Until a person has thirst for the living water, no rearrangement of the lectionary will be beneficial to them. The Episcopalians rearranged their lectionary so that the entire NT is read in a three year cycle on Sundays. Many of their people, and their bishops do not follow the Scripture (this is patently obvious, by just casually observing the immorality that is encouraged, even among their clergy – individuals we cannot judge, but as an organization, it is clear that they are “off the reservation”). Rearranging the lectionary is not the answer for them, or us. Living the Gospel (and also preaching it) is the only answer. The attempts by supposed Christians, including even Orthodox, to consider Jews and Moslems to be “people of faith” is contradicted by our Lord’s words. He said it – if we do not love the Son, we do not love the Father. Why are people afraid to say this? Perhaps it is because in our PC climate, they are afraid of being judged as “Samaritans”. Our Lord was judged – and if they did these things to the “green tree”, can we expect any less? The Samaritan woman was despised, even by her own kind, and yet, we now know her as “Equal to the Apostles”. It is an honor to be called a Samaritan. John 8:42-51 42 Jesus said unto them, If God were your Father, ye would love me: for I proceeded forth and came from God; neither came I of myself, but he sent me. 43 Why do ye not understand my speech? even because ye cannot hear my word. 44 Ye are of your father the devil, and the lusts of your father ye will do. He was a murderer from the beginning, and abode not in the truth, because there is no truth in him. When he speaketh a lie, he speaketh of his own: for he is a liar, and the father of it. 45 And because I tell you the truth, ye believe me not. 46 Which of you convinceth me of sin? And if I say the truth, why do ye not believe me? 47 He that is of God heareth God's words: ye therefore hear them not, because ye are not of God. 48 Then answered the Jews, and said unto him, Say we not well that thou art a Samaritan, and hast a devil? 49 Jesus answered, I have not a devil; but I honour my Father, and ye do dishonour me. 50 And I seek not mine own glory: there is one that seeketh and judgeth. 51 Verily, verily, I say unto you, If a man keep my saying, he shall never see death. You are currently browsing the archives for the Scripture Commentary category.